Over the past few decades, advanced composites have increasingly become smart materials for new structures and the renewal of existing civil engineering infrastructures. 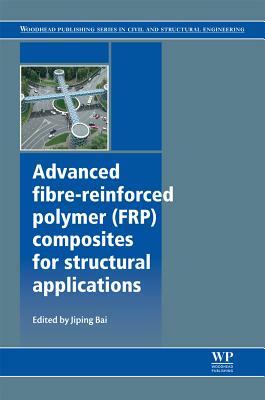 This book focuses on various aspects of advanced fiber-reinforced polymer (FRP) composites in civil engineering and provides an overview of the applications of advanced FRP composites in civil and structural engineering in four parts. Each chapter within a part is written by a leading expert (or team of experts) and deals with a specific topic with detailed referencing to primary sources for further research. Part one deals with FRP composite matrix materials which provide the foundation for composite materials, with contributors reviewing the chemistry of phenolic resins together with their mechanical and thermal properties, polyester thermoset resins as matrix materials, the chemistry of vinylester resins, and epoxy resins commonly available on the market. The mechanical properties of FRP composites are dependent upon the ratio of fiber and matrix materials, the mechanical properties of the constituent materials, the fiber orientation in the matrix, and ultimately, the processing and methods of fabrication, which are the subject of part two. Chapters discuss prepreg processing, liquid composite molding (LCM), filament winding processes, and pultrusion of advanced FRP composites. Part three is devoted to the properties, performance, and testing of FRP composites and deals with the elastic property analysis of laminated advanced composites. This section gives a general overview of composite stiffness and assesses unidirectional reinforced composites and looks into the basic mechanisms involved in the environmental degradation of FRP composites and the impact of the ageing mechanisms of the polymer matrix on the mechanical properties of composites. Part four reviews the use of FRP composites in various structural applications. It covers a wide rage of application in civil engineering infrastructures, including advanced FRP composites to strengthen structures vulnerable to seismic damage, FRP composite materials for bridge construction and rehabilitation, the manufacture and rehabilitation of pipes and tanks in the oil and gas industry, and the rehabilitation of timber and concrete structures.